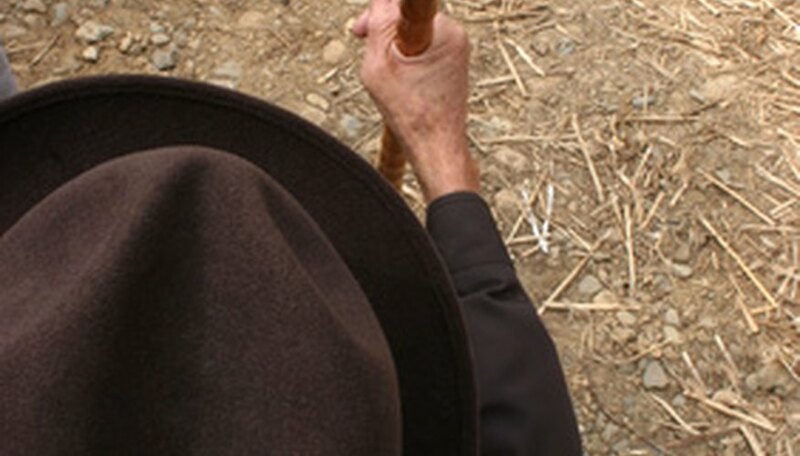 Blackthorn walking sticks are used as both a cane and a fashion accessory. Many people collect walking sticks. This wood was used for walking sticks because of its sturdiness. In ancient times in Ireland, the Blackthorn walking stick was also used as a weapon and referred to as a shillelagh. These sticks are still prized as premium products because no two of them are alike. Select the stick that you would like to use. The stick should be the straightest one you can find and measure at least three feet long. Ensure that when you cut the stick with your small saw you leave part of the root. This makes a good knob to hold in your hand. Store the stick in a dry pace for a month to allow it to dry. Straighten the stick by rubbing bacon fat into the bend. Melt the fat into the stick and rub it in until the stick becomes flexible. Bend the stick once it becomes flexible and hold it in the desired position until it stays there. You will never make the stick perfectly straight, but this process will make the stick straighter than it was. Scrub the stick with a wet brush to make it ready for polishing. Clip the thorns and make them look nice and neat. Prepare the knob for varnishing by smoothing it with a knife. After you are done smoothing with the knife, you can begin sanding with a coarse (100 grit) sandpaper. Once you have finished with the coarse sandpaper, go over it again with a very fine paper (300 or better) for final prepping. Apply the first coat of varnish and then hang the stick in a dust-free environment and allow it to dry. You will want to apply two or three coats of varnish in order to give your stick a hardened finish.